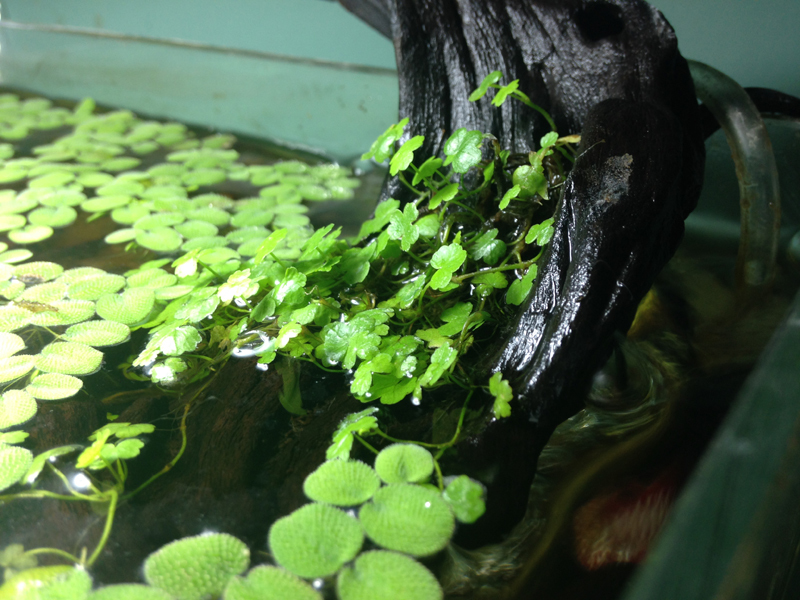 The Planted Tank Forum > Specific Aspects of a Planted Tank > Plants > Plants that live submerged and emerged? Plants that live submerged and emerged? There's 1 1/4" of space between the surface and glass lid of one of my tanks, with a piece of driftwood sticking out the top. Is there any plant I can attach to the emerged part of the driftwood? Something that would be alright growing along the surface or down into the water? It couldn't be something tall since the height is limited, so likely a low carpeting plant. So far I've considered Hydrocotyle tripartita. Are there any other plants that would work on the top of a low-tech tank? GH is kept to around 8.4. Any Anubias or Bucephelandra will work. Many Cryptocoryne will also work, and I'd recommend making a hole in the wood to plant it in. Hydrocotyle, any variety really, is a good option. I like tripartita 'Japan' because it is smaller than others. You can also do many mosses like Fissidens (fontanus or fox fold over nicely) or Flame. Plus mosses, baby tears, most carpetting plants. 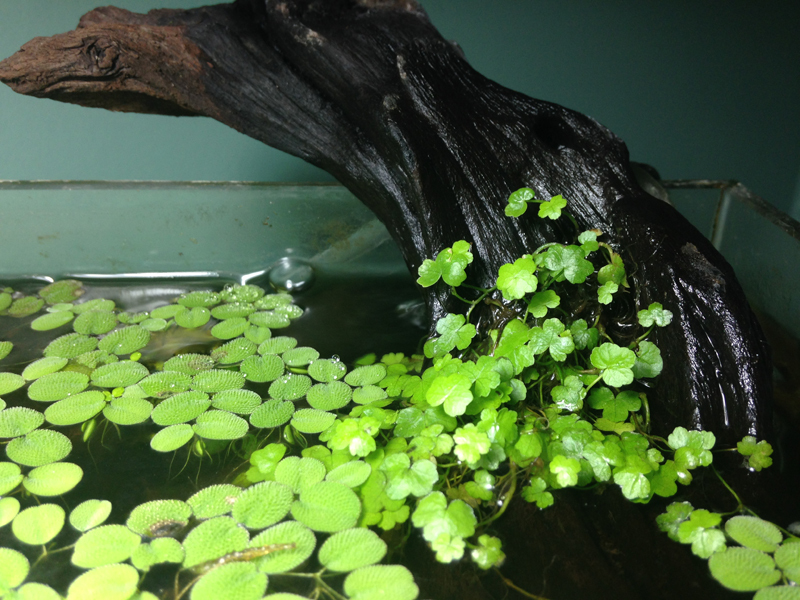 Might not be enough space for rotalas and ludwigia and hygrophila, most of which readily go emersed. 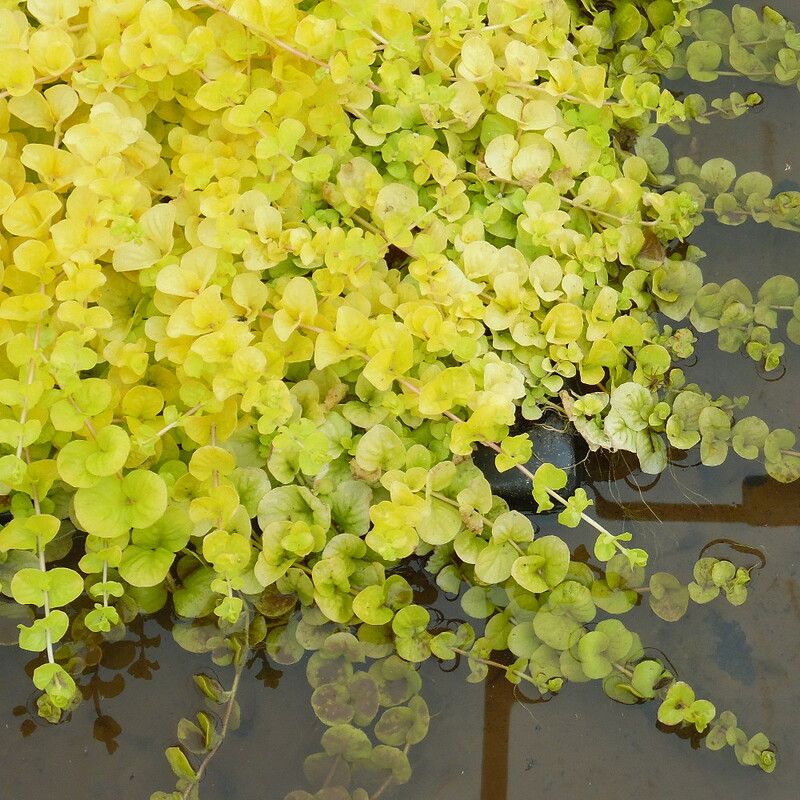 Long root floaters like Amazon Frogbit and water lettuce are good candidates also, especially as they can take extra light / heat. A word of caution: where wood breaks the surface is the prime area for algae, especially for BBA, even more so if in direct flow and densely planted. Just something to watch out for. I started like that with mine sneeking in the odd plant then I thought why put the lid on ? OVT, Nlewis, Thelongsnail and 2 others like this. Thank you for all the suggestions! My lid will have to stay on, this is for a betta tank. Get fiberglass window screen and epoxy and make a little soil planter that hangs off rim barely touching water. 2 layers thick and then I just epoxy some lead plant weight on back side to crimp over rim. Then plant with pond penny you find at any garden supply this time year already in emerged growing state. Just clip off few small vines of pot, wash throughly to get any fert etc off them and plant in your little bog basket. I just use coco peat and a about 4 osmocote pellets per 1 sq in of peat. If it’s getting good light will turn bright gold and start creeping up over aquarium rim and out into water. @theatermusic87;11197181 I don't run CO2 in my tanks, so my riccia fluitans isn't as full as it is in CO2 tanks. I also read that riccia has to be kept damp while emersed, and I'm not entirely sure if sticking out the top will do that or if the top will dry out. For something like this, does it have to be misted often? Or does the proximity to the aquarium keep the leaves hydrated? it's close enough. 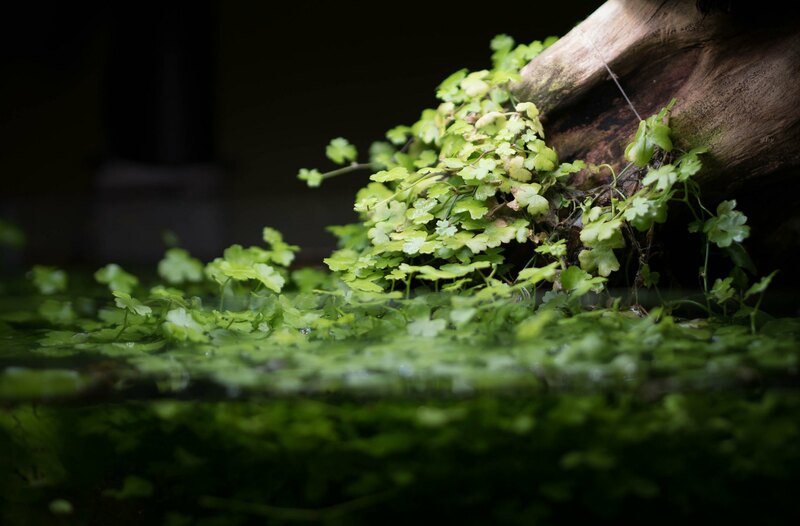 for hydrocotyle japan, definitely no misting necessary. look at my emerged mess... never misted. That grew out from a mass underneath, but as you can see as it got further out of the tank, then, it dried out. so, probably an inch of leeway? Maybe more if tank is covered? @ipkiss Thank you so much for the reply (and the picture!) I got a huge clump of new hydrocotyle tripartia, bigger than I realized it'd be (buy 2, get one free special!). I know there will be an adjustment period and a lot of it will die off (seems like even if I dose algaecide often and dose ferts once a week, bits of whatever plant I have are dying off and attracting algae) so I'm not gluing it to the driftwood just yet. It sounds like it might be okay to wrap it around the top of the driftwood point though, as long as it's not more than an inch above the water line. Hey I'm doing the same thing-growing hydro 'japan' out of water on driftwood. So far it has not needed misting-granted I planted it near the surface where wood is wet, it has not grown up past the moist area yet, but I've seen some thick mounds of this stuff growing out of peoples tanks before. IT should be fine. I should get a photo of mine...its pretty new so not that big yet. @AquaAurora Looks beautiful! Did you glue it to the driftwood? And if so, how long did you wait after receiving the plant to do so? No glue used, the wood has some holes I just stuffed the plant roots through.